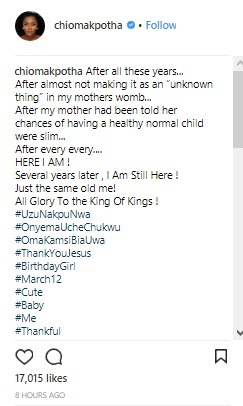 Nollywood actress and movie producer, Chioma Chukwuka Akpotha has shared her cute baby picture as she celebrates her 38th birthday today. The gorgeous actress took to social media and shared a sweet message with her fans. BUT when I look back, all I see is a HAND! The hand that has held and supported me through it all...guiding , protecting and shielding ! The hand that does me good and has kept me and all that I call mine safe. As I celebrate my birthday today, I just want to say I’m grateful and thankful to you Jesus! Continue to take all the glory!" Several years later , I Am Still Here ! Just the same old me! All Glory To the King Of Kings !